Rural districts: Phong Dien, Co Do, Thot Not, Vinh Thanh. Cantho is located in the center of the 11 provinces of the Mekong Delta, 170 km from Ho Chi Minh City, South of the Hau River. The Hau River is considered a benefactor of this region, since yearly floods deposit large quantities of alluvia to the rice fields. The climate condition in Hau Giang is harmonized with a few of storms. Rain season lasts from May to Nov, and dry season from Dec to Apr. 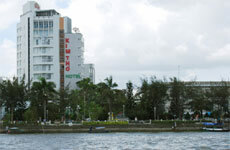 Road: The bus station is about 2km north-west of the centre, along Nguyen Trai St. Regular connections with Ho Chi Minh City Mien Tay Bus Station and other centres in the Mekong Delta. - Our hotel has been designed according to modern architecture, 101 rooms with balconies looking at the third junction of Hau river, swimming pool and Can Tho city whole view. When staying at our hotel, visitors not only enjoy the multi-service of a four-star standard hotel but also satisfy by our well - trained staff. It located at the center of CanTho city, Asia Hotel has a spacious, airy and convenient area. Bedroom in Asia Hotel is convenient polite, safe and competitive price. Tay Do The center of Mekong Delta - There are fields encompassed by water ways making a romatic beauty of western - southern VN. especially the busthing trade on the river,which attracted thousands of visitors.Visiting Can Tho tourism area,the tourist will be pleased with the comfortable accommodation of Tay Do hotel system. - Tay Do is one of hotels equiped with modern facilities and the interior was designed in a nice and unique way,opened door August 02.